Ed Mancuso makes things that kill people. He might have been a very rich man or someone serving time in prison had it not been for the fact that he makes these UKD’s (Unusual Killing Device) for the CIA and he is very good at it. Mancuso, a native New Yorker born of immigrants from Italy, never attended college, though he easily could have with his very high IQ and superior results from high school. When he was 18 and just graduating, he created and tried to market an ingenious new silencer for handguns. He offered to several gun manufacturers and one accepted it. That company was wholly owned by the Agency. They destroyed the patent application, paid him a good deal for his work, and then hired him to work exclusively for them. Since then, for the past twenty years, he has been their chief creator of unexpected mayhem. The Agency has taken extreme care with Mancuso, worrying that his personality might interfere with his productivity if he learned who or why or on whom his innovative devices were used. Additionally, they tried to limit their use of his talents to three or four assignments per year. Mancuso is of average height, 5’8”, but quite thin. He has black hair and brown eyes, is moderately attractive, and fairly athletic. He enjoys, when he is not building innovative explosives, scuba diving, chess, tennis, and occasionally the company of a lady. Playing almost as important a role to the events in the two-book series is his counterpart in the KGB, Vasily Borgneff, a man who seems to be a carbon copy of Mancuso, every bit as interesting and just as good at making UKD’s as Mancuso is. What makes the first book so delightful is that both Mancuso and Borgneff have decided that they were tired of what they were doing and were planning to quit. Their respective agencies, however, let them know that no one just quits. It is interesting when you tell a man they must either kill or be killed. When that person is an expert at the former, it can be hard to accomplish the latter. 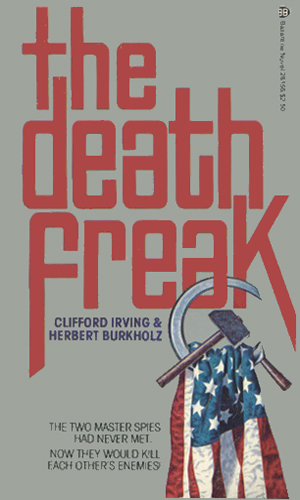 Note: apparently the first book, The Death Freak, was at one point published as being written by John Luckless, a pseudonym for Mr. Burkholz and Mr. Irving. Mancuso had a fair amount in common with KGB man Borgneff. They both created incredible devices for killing people. They both loved the same exotic woman. And they were both targeted for elimination by their own spy agency. The father of the woman Mancuso is in love with, the current Undersecretary of Defense, has a problem he needs Mancuso's help with. He loves America with all his heart and would not do anything to harm her. Unfortunately, 35 years ago, he was a Soviet sleeper and now they want him activated. And the CIA wants him dead. 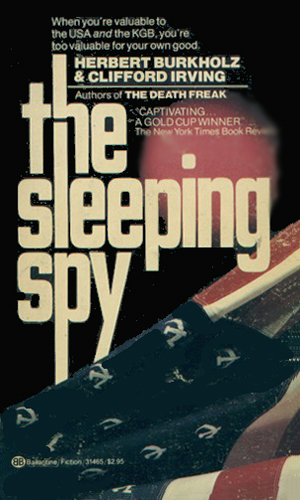 This is a fun, and very different spy-fi series. Done totally tongue-in-cheek, it is a great send-up of many stereotypes, all while presenting a story of an underdog against the system and winning. It will give you quite a few chuckles and an occasional "oh yea!". I loved the fact that when pushed, both Mancuso and Borgneff are very good at pushing back and doing so in interesting manners. You would think that the Agency would have been smart enough to just step back and wave goodbye. They are not and this series is fun because of it.